Whether you’re looking to modernize or simplify your home’s look or home systems, the latest appliance trends can do both, as well as make your home life easier. If you’re daydreaming about remodeling, it’s natural to let your imagination linger over the latest and greatest in home appliances. With technology on its present fast pace, manufacturers are constantly upgrading and innovating their products. Here are some of the hottest trends in home appliances. The stainless steel appliance trend isn’t going away anytime soon — and for good reason. Stainless steel finishes are scratch-resistant, rust-resistant and incredibly durable. A stainless steel kitchen also looks quite smart, adding modern flair to any home. But the beauty of stainless steel appliances is more than skin deep. In addition to being able to stand up to the wear and tear of constant use, stainless steel finishes are also very easy to clean. This is why stainless steel appliances have long been standard fixtures in commercial kitchens. No special cleaners are required either. All you need are a clean rag, soap, water and a little bit of elbow grease. Want more information on how simple the upkeep can be? 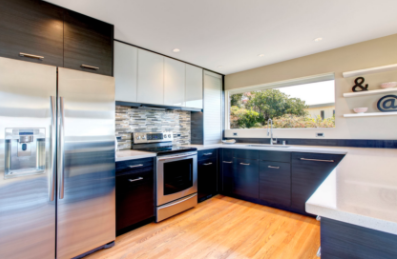 Check out this helpful article on how to clean stainless steel appliances. Chewable ice makers are one of the hottest of all home appliances. They are also a very new innovation and were just brought to market in 2016 thanks to a highly successful crowdfunding campaign. Chewable ice makers produce a softer ice in the form of grainy pellets — the kind of ice you may be used to getting whenever you order a cold soda at your favorite drive-thru. Now you can make that same ice at home. If you are considering an addition to your home, a ductless air conditioner can be a game-changer. Rather than re-routing or adding onto your existing HVAC duct system, you can easily control the climate in your new bedroom, living area, game room or even “man cave” with an independent ductless air conditioning unit. One major benefit of ductless air conditioners is they are flexible to your temperature needs — you don’t have to turn on the air conditioner until you are ready to occupy the room and it will quickly reach a state of comfort. Ductless air conditioners are also quiet, especially when compared to more bulky window units. And, thanks to their energy-efficiency, you can even obtain a rebate after installation. See energystar.gov for more information and a list of available rebates. If you’re serious about hopping onboard this home appliance trend but still have questions, check out our recent guide to ductless air conditioners. Ready to purchase state-of-the-art appliances for your home? If so, be sure to protect your investment with an American Home Shield® Warranty. Our customers will also have access to the Appliance Discount Program, which can help reduce costs associated with replacements in the home.